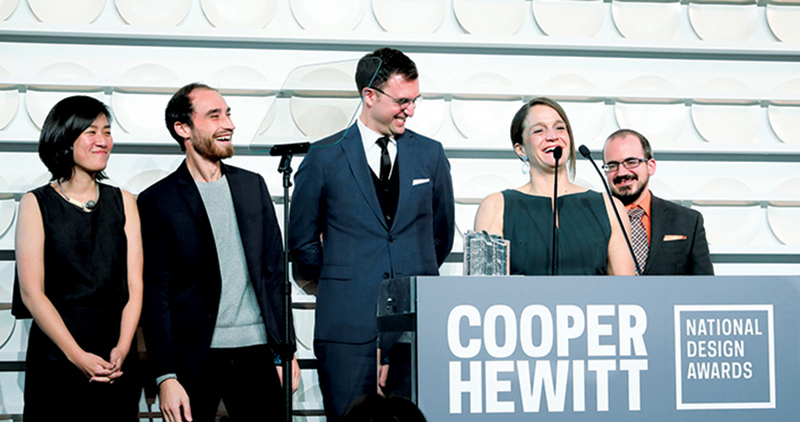 After a decade of expansion and growing influence, Design for America wins the prestigious Cooper Hewitt National Design Award. What stands in your way for receiving mental health services? What type of job would you like? The interviews, part of the 2018 Design for America Leadership Studio, were step one of a human-centered design process — gathering insights from community members, the potential users of the studio participants’ designs. Those participants — themselves not so far removed from high school — were unified by the Design for America (DFA) mission to solve community-based problems using the human-centered design process. The goal of this year’s studio supplied the driving force: Empower teens to live their best lives by giving them support for mental health issues, access to mentorship, and preparation for future careers. Like all DFA studios, this summer gathering featured interdisciplinary teams of students, faculty, and professional mentors from engineering, the natural and social sciences, and the arts. Launched in 2009 at Northwestern Engineering as an extracurricular organization, DFA now boasts a network of 38 college chapters in the United States, additional international clones, a robust and active alumni, mentor, and industry network, and a thickening portfolio of success stories and awards. DFA’s growing impact on design worldwide earned it a prestigious 2018 National Design Award for Corporate and Institutional Achievement from the Cooper Hewitt, Smithsonian Design Museum. Launched at the White House in 2000, the annual awards program celebrates design as a tool in shaping the world. With this honor, which is “bestowed in recognition of excellence, innovation, and enhancement of the quality of life” according to Cooper Hewitt, the group now takes its place among an esteemed list of previous winners, including Apple, Etsy, and TED. “Less than 10 years ago, three students and I were sitting on my office floor imagining the potential of Design for America, and today we are realizing the vision of this growing network with increasing impact,” says Liz Gerber, Northwestern Engineering associate professor of mechanical engineering and DFA’s faculty founder. Capturing honors in the corporate and institutional category is humbling, of course, but also confirms that DFA’s work matters. “The award makes visible what the network sees each day and demonstrates that Design for America has something important to offer,” says Rebecca Breuer, DFA’s executive director since January 2016. At the DFA Leadership Studio, student leaders attacked the challenge of empowering high schoolers using DFA’s curricular roadmap — understanding users, generating ideas, and rapidly building and iterating prototypes — to construct thoughtful, pragmatic, and scalable solutions. In a spirited and animated manner, both purposeful and personal, the DFA teams used materials and tools ranging from Post-It Notes to cardboard to yarn to computer screens. One team developed an event where students could perform monologues or dances to express emotions about trauma. Another created an app matching mentors with mentees. This year’s Leadership Studio was only one part of DFA’s summer initiative, now known as the DFA Summit. The Create Impact Conference brought together devoted DFA alumni and young professionals to gain new tools for creating impact, while the invitation-only DFA Symposium challenged DFA mentors, design educators, and industry professionals to rethink how they can help shape the next generation of social innovators. “We bring people together under the shared belief that we can make changes now,” DFA instructional coordinator Rob Calvey says. “And that’s proven to be incredibly empowering and motivating.” Rather than give students final grades or course credit, DFA helps them develop personally and professionally and provides the satisfaction of crafting meaningful solutions to real-world problems. “It’s a framework for innovation and positive societal impact,” says Gerber, Charles Deering McCormick Professor of Teaching Excellence. The students arrive with excitement, curiosity, and drive; faculty members, DFA mentors, and community partners provide the required expertise, guidance, and connections to help them grow through experimentation and iteration, even failure, on their path to a solution. “DFA is filled with like-minded people who want to use design skills to make the world better, who want to figure it out even when things get messy,” stresses Breuer. It didn't take long for DFA to blossom from that group of three Northwestern students into the robust national organization Gerber envisioned. Within a year of DFA’s founding—and spurred by the inaugural DFA team’s Facebook progress reports and communication with peers at other institutions—Dartmouth College and Cornell University started DFA chapters. The following year, seven universities held DFA studios, and dozens inquired about establishing their own chapters. With an eye on scale, Gerber spearheaded the creation of written tools, such as the DFA Process Guide, an online platform for project and studio management, and a professional mentor and partnership network to expand the DFA reach. These efforts were powered, in part, by seed funding from Northwestern Engineering Dean Julio M. Ottino that allowed Gerber to hire administrative personnel. “This initial investment was critical for building the network,” Gerber says of the support. Empowered and motivated, DFA introduced a one-year fellowship program in 2010 that charged recent alumni to oversee network operations while simultaneously pursuing their own professional growth. 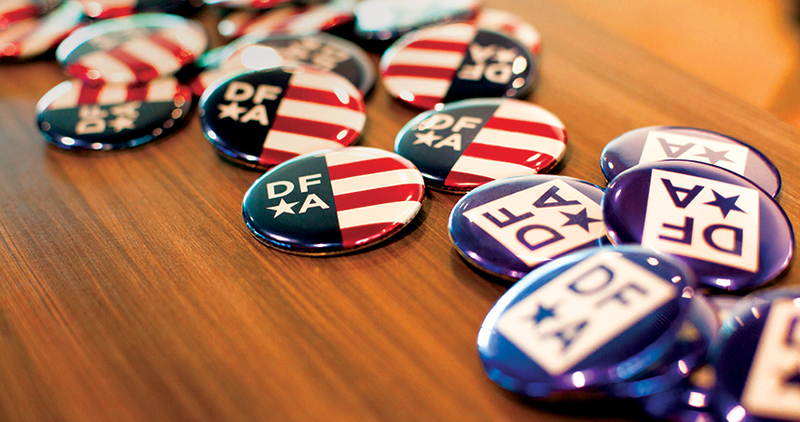 A year later, DFA organized its first Leadership Studio. That annual event draws DFA chapter leaders from across the United States to the Northwestern campus to sharpen their leadership skills and design processes. Previous years’ studios focused on topics such as childhood asthma and urban flooding. “DFA is all about impact and improving the world around us through a network that’s committed and engaged,” Breuer says. In addition to fostering a new generation of social innovators, DFA has elevated its own profile on the design scene. With each passing year, the pace and scope of its impact grows thanks to the DFA model, which includes chapters, community partners, and alumni. The DFA national network of 38 chapters at universities such as Stanford, Yale, and Duke encompasses more than 1,200 students. Each year, DFA teams tackle more than 150 projects addressing topics such as homelessness, healthcare, and accessibility. More than 100 DFA faculty mentors provide crucial feedback on student work and facilitate connections with working professionals — architects, city planners, hospital administrators, and entrepreneurs — who share their perspectives and expertise and help extend DFA’s reach into new corners of society. DFA enjoys a growing roster of community partners. This includes industry-leading enterprises, community agencies, and nonprofit organizations that have engaged with the DFA network to tap into its unique problem-solving perspective, usable insights, and prototyping capabilities. For example, over the past five years, Fiat Chrysler has worked with various DFA studios on projects related to shared mobility, self-driving vehicles, and distracted driving. The automaker has elevated a number of those projects into its next round of internal consideration for implementation. The Open Doors Organization, a nonprofit focused on empowering people with disabilities, enlisted DFA’s expertise to help ease air-travel challenges for power wheelchair users. “The creative solutions our community partners see are the cumulative total of the problem-solving spirit that runs across the DFA network,” says Calvey, who co-founded Virginia Tech’s DFA studio in 2011 and joined the national office in 2013. The DFA alumni network, now nearly 2,400 strong, stretches around the globe. It includes architects, engineers, teachers, nonprofit directors, and more who bring their human-centered design mindset to such dynamic enterprises as Apple, Microsoft, SpaceX, and Tesla as well as to government agencies and higher education institutions. A number of alumni have developed DFA-inspired programs beyond the United States, setting up training programs and design challenges in Taiwan, Pakistan, and China. For these international endeavors, DFA’s national office provides support ranging from educational resources and alumni contacts to guidance on creating sustainable programs.